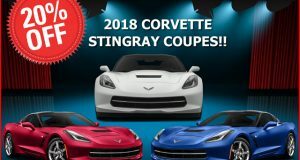 Next Generation Corvette Could See Mid-Engine and Hybrid Variants - MacMulkin Corvette - 2nd Largest Corvette Dealer in the World! Car and Driver magazine recently unveiled more details about the upcoming mid-engine Corvette that has been making occasional press for the last few years. According to their “source”, the 2019 Corvette, code named “ZERV” will make its official appearance at the North American International Auto Show in Detroit in January of 2018. 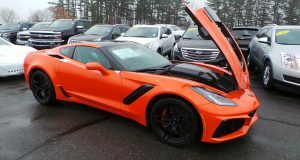 Under the hood, will be an updated version of the current C7 Corvette’s pushrod LT1 engine making between 450 – 500 hp and carrying a base price of $80,000. Considering the LT1 engine is currently putting out 455 – 460 hp and Corvette sales have been sinking for the last several months, we can’t help but be skeptical that the new C8 Corvette will appear with the same type of horsepower for roughly $24,000 more. However, Car and Driver also states that a “notable power upgrade” will be released in January of 2019 and will come from a DOHC, 32-valve V-8 engine and will be shown at the NAIAS in Detroit in January 2019. This will be followed by a hybrid Corvette known as the E-Ray which GM has already trademarked and will carry electric front-wheel propulsion. However before the C8 Corvette officially takes a bow in front of the public, the C7 Corvette generation will go out with bringing back the ZR1 Corvette in the last model year. The ZR1 will carry a major power upgrade to end the C7 generation in style. 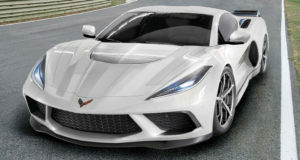 To throw more fuel on the mid-engine fire, the Corvette Action Center has recently heard rumors that the mid-engine Corvette could be built along side of the C7 Corvette and will continue into the C8 generation as C7 Corvette production winds down. The reason behind a mid-engine Corvette is that in light of the current Z06 putting out 650 hp and 650 lb-ft of torque, GM has taken the current front-engine Corvette platform as far as it can possibly go. The C7 Corvette generation was originally intended to only run for about 5 years. 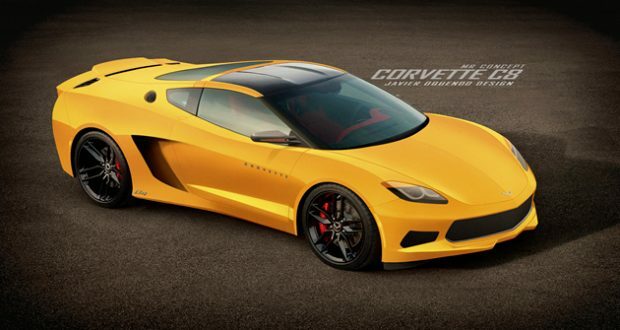 It will be the shortest Corvette generation since the 1963 – 1967 mid-year Corvettes known as C2. Given Car and Driver’s predictions, 2018 could very well be the last year of the C7 and most likely we will see a high-powered ZR1 Corvette to usher in the end of this generation. The C8 generation will be a radical departure from anything we’ve seen before from the marque. The C8 will either be all mid-engine, or have a high output, mid-engined variant while the base model will continue on with a front-engine, lower horsepower design. The mid-engine Corvette will be called “Zora” in honor of the Corvette’s first Chief Engineer, Zora Arkus-Duntov who fought incessantly to try and bring a mid-engine Corvette to market. Whether or not any of this is true, only time will tell. One thing is for sure, it looks like GM will continue to keep the Corvette on the forefront of automotive technology and continue to make America’s only true sportscar, a force to be reckoned with in the highly competitive sports car market.